Some of the cheesiest songs are the best remembered, but no-one wants to admit to liking them. It more recent times, it’s become more fashionable where they are now called ‘guilty pleasures’ – which, for some reason makes it more acceptable. Songs like Agadoo, Atmosphere and Barbie Girl are often cited, by the narrow minded, as the worst records, but they are actually clever because you never forget them. The man who recorded this week’s subject didn’t like the song when he first heard it claiming it was too sappy. He eventually did, and it spent four weeks at number one in both the US and UK and in the process spent 40 weeks on the UK chart and sold over a million here and five million in the States, now get that yellow ribbon out and I’ll tell you where to tie it. Tony Orlando was born in 1944 and began his musical career in 1960 when he formed the doo-wop group the Five Gents, they lasted just a few months before Tony decided to forge a solo career and the following year signed a deal with Epic records in New York and his first single was Halfway To Paradise which reached number 39 on Billboard but got to number three in the UK when covered by Billy Fury. The follow-up, Bless You, became Tony’s only solo UK hit which reached number five later the same year. In the mid-sixties he turned his hand to production and a couple of years later took up the job as vice-president at CBS Records in New York. It was only a twist of fate got Orlando back as a recording artist. In 1970, Hank Medress, who had been a member of the Tokens but left to become a producer, and his friend, session musician and producer, Dave Appell approached Orlando with a demo tape of a song called Candida by a session group called Corporation which comprised a session male singer and two female backing singers, but the pair weren’t happy with the male vocals, but loved the song and wanted Orlando to sing it. “I told them I couldn’t do it because I worked for CBS and it would be a conflict of interests,” Orlando said in an interview with Bruce Nash, “I’m not about to lose my job so forget it guys. 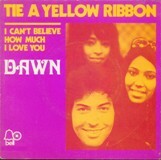 They told me they didn’t have any money, they said ‘we’re broke, please help us,’ so I agreed but under one condition which was, if you publish this song you can’t use my name.” They agreed and it was released under the moniker Dawn which was the name of the daughter of their original producer Steve Wax. Candida reached number three in the US and number nine in the UK and thus prompted the producers to want to record an album. Tony felt bad and approached his boss, Clive Davis, to tell him what he’d done and sort of ask his permission. Davis agreed only after Orlando said, “I assured him that there would be no more hits from this group.” The first song recorded for the album was a song written by Irwin Levine and Larry Russell-Brown called Knock Three Times. Orlando told Davis about it and said, “I guarantee this ain’t going nowhere; who’s going to buy a song about a guy knocking on the ceiling and on a pipe?” Actually millions. At this point Orlando decided to quit his job at CBS and devote his time to Dawn. So, to add a little more context to the story that was relayed in that Greenwich Village pub, basically in medieval times, a knight would give a pennant or a scarf to a loved one as he left for battle, and from this, wearing coloured ribbons became a popular way of showing support. The civil war film, She Wore a Yellow Ribbon (1949), starring John Wayne, underscores the lineage. Yellow was the official colour of the US cavalry and used in the piping on uniforms and regimental standards. The journalist, Pete Hamill, wrote about it in the New York Post and the story was made into a TV drama starring James Earl Jones. When Russell-Brown and Irwin registered the song for copyright Hamill filed suit for infringement claiming that the authors said they heard the story while serving in the military. His decision to sue was probably enhanced when the BMI (Broadcast Music, Inc.) announced that the song had been played three million times and Hamill thought he would get a decent pay out, but the case was dropped when some staff working for the songwriters turned up archive material of the story that had been published long before Hamill’s piece had been written. Many artists have used that song in their live shows including Perry Como, Frank Sinatra, The Drifters and Bing Crosby, that latter of which actually recorded it the same year as Dawn. Connie Francis recorded an answer version called Should I Tie a Yellow Ribbon Round the Old Oak Tree?